Much loved family classic British comedian "Mr. Bean" (Rowan Atkinson) appeared during last night's opening ceremony of the London 2012 Olympics. 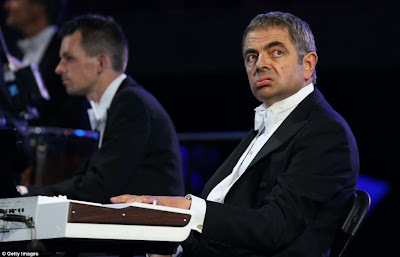 His short 4 minute skit involved accompanying the orchestra on keyboard, playing the song Chariots of Fire. Rewatch this hilarious act here! Cloud gaming services like OnLive and Gaikai are a way to bring modern PC games on much less powerful hardware than what you’d normally need if you installed the game on your own PC. They are also great for democratizing the console market and gaming hardware in general, because you can now use less powerful consoles to play games that look just as good. OnLive will deliver a full console-class experience, bringing hundreds of top-tier games from more than 80 publishers to the OUYA console for play on demand. OUYA owners will be able to jump in and play any of these games both at home on their OUYA console, and on the go on PCs, Macs, tablets and phones, never leaving a game behind. Instant demos will be available for nearly every game in our ever-growing library—from eagerly anticipated indie titles like Ravaged, to hot blockbusters like the upcoming Darksiders® II. Players can experience up to 30 minutes of each game for free before deciding what to buy. If they like it, they can continue playing where the demo left off. The OUYA team has also showcased its controller for the console, and although it looks interesting, it isn’t a breakthrough in controller design. The company would’ve probably been better off using an off-the-shelf controller that is much cheaper, and also support other types like PS3 or Xbox 360 controllers. K-On! the movie shouldn't really be considered a sequel, but rather much of a side-story that leads into the final episodes of K-On!! the anime series. What this movie aims to achieve is more laughter, cuteness and emotional moments to be remembered. Graduation draws near for Yui, Ritsu, Mio and Tsumugi, the four 3rd-year students of the Light Music Club. They, together with Azusa, decide to go on a post-graduation trip. Their destination, decided by lot, is London! It has been a while since I watched K-On!! and so I vaguely remembered the characters and the events that happened throughout the anime series. Well now the movie has came out and at first I thought it was a direct sequel that explored the lives of the girls after their graduation. However, I was pleasantly surprised to discover that the movie was actually a one big side-story leading up to the events that take place in the final episodes of K-On!!. The movie was intended for a large audience and so the movie assumes that you have not watched K-On! before. It introduces the characters once again and explores their personalities throughout the film. For those who have seen the anime series, the movie in no way relate to the main story, except the ending was quite similar indeed. The story was quite simple, easy to follow, and contained many humorous elements throughout. You will not be disappointed. For me, I felt like the art has been improved from the series. Could be just me, but I felt the environments, objects, characters and buildings all had fine detail on them. Animation was rock solid and transitions were smooth. There was some nice use of visual effects like the individual snowflakes that fall in one particular scene. London was really well animated and looked really similar to the real thing. Location-wise, the movie has captured appropriately of locality difference. Sound quality and music was perfect as expected. We see the return of the nostalgic catchy music that invigorates our heart such as "Curry Before Rice", and the popular "Fuwa Fuwa Time". In addition, we see the "making" of the song dedicated to Azusa, which is presented at the end of the movie and the anime series. Voice acting was perfect and suited the characters really well. I surely missed the humorous conversations the girls have as they go about their lives. The movie brought back plenty of memories of these extremely peppy and cute characters. I still think Azusa (Azu-nyan) is still my favourite of them all. The movie does not introduce any new characters but does feature a few minor characters that support the group from behind the scenes. Yui is still naive and peppy as ever, Mio is still shy and easily embarrassed, and Azusa is still genuinely cute in every way possible. Although, watching the movie made me realise the fact that these girls are meant to be third-year high school students, but their actions and character representations really makes we wonder if they are actually much younger (say 14 or 15?). Perhaps the intended visual presentation of these characters were more to the "chibi" and "kawaii" style rather than realistic-like. In the end, just watching that ending bright back plenty of nostalgia and emotions that not many other anime has achieved. The concept and story was just brilliantly executed and planned. Whether a sequel would happen or not, I will never stop missing the cute characters and the catchy songs this anime has to offer. I am unsure how this anime would appeal to older teens, otaku guys, or adults alike; but let me tell you, it is just a wonderful musical masterpiece that will capture your heart and attention throughout the film. From a slow start that reintroduces the characters, the story takes a lift-off into a captivating and interesting story. Art has been improved with detailed backgrounds, visuals and fluid animation. The music was happy, peppy, and catchy as always. Voice acting was perfect and dialogue was hilarious at times. The characters were full of life, had unique personalties, and just made the movie entertaining to watch. I have anticipated to watch this movie for a while now and so I'm glad that I finally got to watch it. Love the story, the music, and the characters. It was entertaining and nostalgic to watch. Definitely recommended to those who want some light-comedy, slice of life, girl band anime.